What Do the Grandmothers Say? I’ve been thinking a lot about my great, great grandmother, Katherine McCabe. Like me, she was mother to three boys. I discovered her last Spring while doing family history research (I’ve been an avid family genealogist since 2000) – even finding this photo online of the McCabe family, who came from Cavan, Ireland in the 1800s. 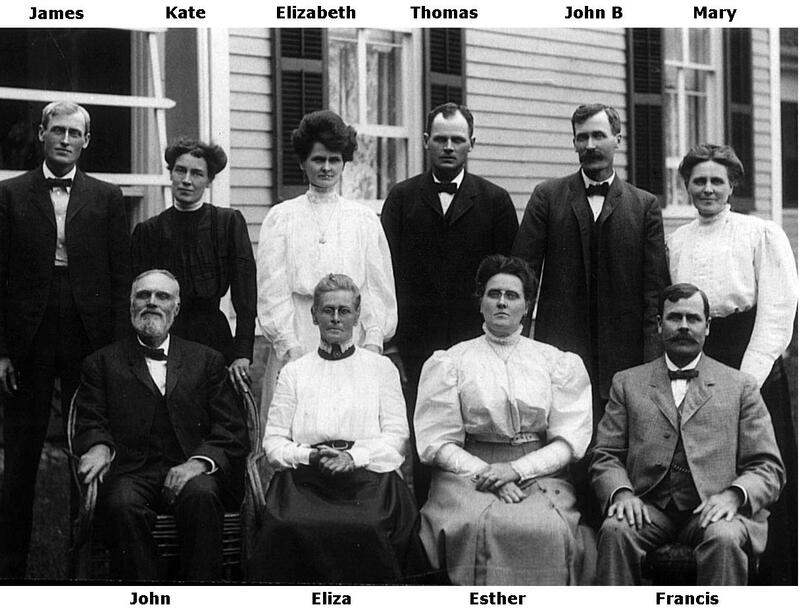 Here she is, dressed in black, standing right above my great, great, great grandparents John and Eliza. The family settled in Campbell and Bath, New York and Kate eventually married my great, great grandfather John C. McNamara, who left her a widower in 1905. For some reason she has stayed with me. Perhaps it is because I can see a bit of myself in her expression here. Or perhaps it is because she also had three sons. Perhaps it is because I’m about to birth my third child, and the continuation of my family tree is unfolding. In gestating a new member of my family, I can feel the cells from thousands of ancestors and places culminating in my story, my baby’s story. These moments before birth connect me to all the women before who have birthed my lineage into being. I can feel some of their journeys tangibly through my research: traveling across oceans during tumultuous times. Fleeing the potato famine. Living in crowded boarded houses in Brooklyn. So many mothers losing so many children. Accidents. Whole lifetimes of stories. Widowed. Old… The heartbreaking cycles of life coalesce here and now as I wait for baby to be born. Days aren’t just days – they are actually the culmination of millions of years of evolution, genealogy and history. Days aren’t just days – they are the ongoing writing of deep, rooted story lines, weaving pattern lines on my skin, my children’s skin, right here. We connect serendipitously through a website page where his war memoirs were published. He’d mentioned my grandfather here, writing about how my grandfather had visited his foxhole the night he was killed. It was a pitch black night and he wondered how my grandfather had even found his way. They’d talked about the good old days and how my grandfather was a Golden Glove boxer in Cleveland, Ohio. He took a swig from Rhodes’ canteen. At the last minute he traded foxholes with another soldier, Alfred Sheridan. Shortly thereafter, my grandfather was killed during the onset of the infamous Battle of Hill 122 – some of the worst fighting those in the war would know – and Sheridan and Rhodes lived on to tell the story: The training in England with tents pitched on a hillside overlooking the Channel. The nighttime jaunts to English teahouses in search of food. The startling announcement that it was already D-Day. The rope ladders off a cliff into the ships. The landing together in assault boats on Utah Beach, Normandy. 200 men started together, and within five weeks Rhodes and Sheridan were two of only 27 men to survive in Company L.
This is history, yes – but it is also the story of living bones and tissue coming to a tragic end at age 19. This was a young man who was already a husband and father. I reflect on how without his blood and body, my existence would have never been. So it is with absolute awe that I listen to Bill Rhodes recount the last wanderings of his life. 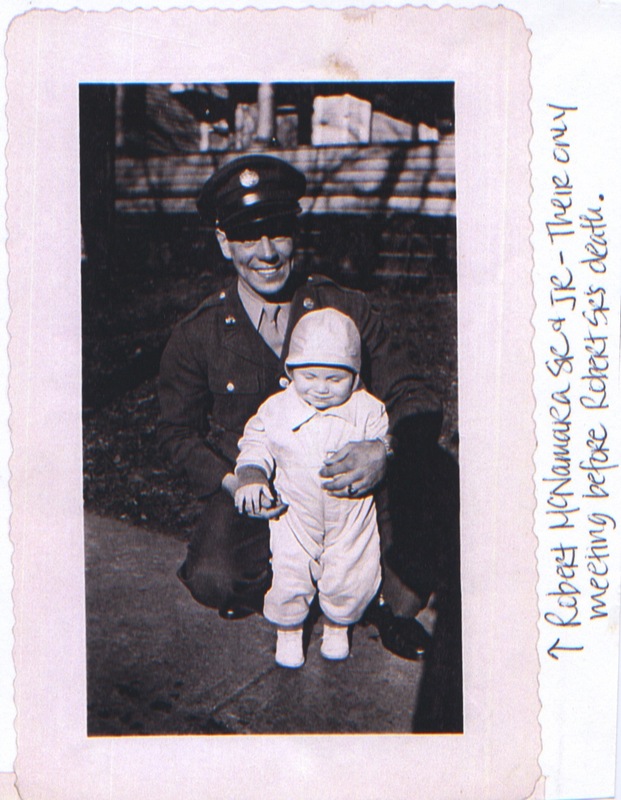 Here is the father my dad never knew. Here is the man who was my grandmother’s first love. Here are the genes my son Rowan’s wiry body has also inherited: genes of a Golden Glove boxer from Cleveland, Ohio. This is also a story come full circle. It so happens that the man who posted Bill Rhodes’ memoirs online is the son of Alfred Sheridan, the other veteran who was with my grandfather the night he died. Sheridan and McNamara switched foxholes. McNamara died and Sheridan lived. Sheridan’s son tells me that in the 1980s, shortly before his father’s death, his father cried, saying, “It should have been me, not McNamara.” Rhodes tells me he felt badly about this foxhole switch his whole life. A crazy twist of fate meant life for one, death for the other. A simple switch at the last minute determined the course of history for at least our two families. And now, the Sheridans and McNamaras connect. We give each other blessings. The son thanks my grandfather, and all of us, on behalf of his whole family. He only wishes his father were alive to speak with us. We all agree: something has come full circle. Here we all are, 67 years and three generations later, creating a web of story and connection in the year 2011, where the tides of history ripple in our bones and minds -converging in this rare and precious moment of revelation and homage: A mystery that life would have us meet to share a story that was waiting to be told.